14-07-10: Community Forestry Research Project - Please Help! 07-07-10: FGVW Family FunDay 2010 a Great Success! 04-05-10: Bluebell Season Now Open! Are you interested in harvesting, juicing and preserving fruit in North Leeds? Yes? ...Then please get involved with Leeds Urban Harvest. The first picking and preserving weekend is 11th and 12th September 2010. Leeds Urban Harvest is a voluntary run project that collects and distributes soft fruits that grow unharvested around our city on trees and bushes in both public and private spaces. Fruit is distributed to groups, volunteers and the local community. Damaged fruits are turned into juice, preserves, jams and chutneys. Any money raised is put back into the project to help with running costs. We are also creating a detailed reference map of Leeds with location and tree information for future harvests, accessible to anyone. As part of the project we aim to raise awareness of the great abundance of local tasty and healthy food that is available for everyone and for free. GROUNDWORK is delivering a series of free bat walks which are open to the general public and will be led by trained volunteers. The walks, taking place at various locations across Leeds, have been funded by the West Yorkshire Bat Group. Walk leaders will show you how to use a bat detector, tell you about the different species, their habitats and habits! The walks are open to participants of all ages, but please note that children under the age of 16 must be accompanied by a responsible adult. Walkers are advised to bring: suitable waterproofs and/or windproof clothing/stout footwear and a hand torch or head torch to provide illumination. Please note that if weather conditions are poor, walks may be cancelled. We've added a new page to the Flora & Fauna section which includes information on butterflies found in Gledhow Valley Woods. At present there are details of 14 species of butterflies listed, with photographs kindly provided by photographer Andrew D Ramsay. Please see The Butterflies of Gledhow Valley page. Note: We would be very grateful for any help you can give in adding to our gallery ...if you have any photographs we can use please contact us. The Gipton Spa Bath House on Gledhow Valley Road will be open to the public under the supervision of FGVW members from 12-4pm on Sunday 12th September 2010 to correspond with the country-wide "Heritage Open Days" event ...Come along for your free tour! There will also be refreshments and an FGVW stall promoting the group, selling merchandise (including Christmas cards, greetings cards, postcards, coasters and place mats), and providing general information about the Bath House, the woods, and the Group itself. On Sunday 5th September 2010 (9.45am-12.00pm) there will be an Action Morning which will include clearing and preparing the Bath House for the Open Day. Please come along if you are able to help. Community Forestry Research Project - Please Help! We have been asked to help with a study concerning Community Forestry and how the members and participants view the management objectives of their woodland. The crux of the research is a comparison between community projects which receive support from the Community Forests organisation and projects which are outside of a Community Forest remit, such as Gledhow Valley Woods. The study is being carried out by Sam Sharples, a student studying for a MSc in Forest Ecology Management at the University of Cumbria. A questionnaire is being sent out to four community forests in the North of England to compare and contrast opinion. The questionnaire forms a key part of Sam's research and he would be very grateful if you would spend five minutes filling it in. The Members Questionnaire asks for your opinion on how Gledhow Valley is managed. It can be filled out electronically and returned by e-mail or printed out, filled it in by hand and posted back. Alternatively, if you would like Sam to print a copy and post it to you, please contact him with your name and address. Please return completed questionnaires before the end of August 2010. The Participant Information Sheet should help to answer any further questions, but if you have any other enquires please e-mail Sam at s0906729@cumbria.ac.uk or ring him on 07973 764 370. There will be an FGVW stall at the St Matthew's Strawberry Fair on Saturday 17th July 2010 (2pm-4pm) promoting the group, selling FGVW merchandise (including coasters, place mats, greetings cards, postcards, framed pictures, badges & photos), and providing general information about Gledhow Valley Woods and the Group itself. 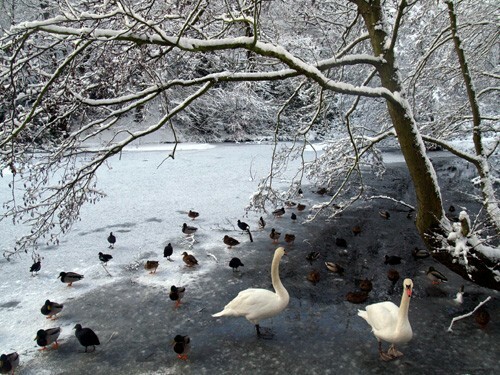 We had a great response to our winter photo competition, with a total of 120 photos being submitted for consideration. A short-list of 14 entries were then put on display at the 2010 FGVW FunDay, and visitors were asked to vote on which they thought would make the best FGVW fund-raising Christmas cards. A total of 67 people voted, and owners of the most popular photos will be receiving bottles of fine quality organic wine courtesy of Ecology Building Society. Any photos which are used in creating FGVW Christmas Cards will be fully credited to the photographers, who will also receive some of the cards to use themselves. The top 4 photos are shown below in no particular order. FGVW Family FunDay 2010 a Great Success! As always, we would like to say a very big 'thank you' to everyone who helped... those who spent hours assembling tents all morning; those who provided home-made food for the refreshments tent; those who helped run the stalls and activities, and sold raffle tickets; those who helped pack everything away at the end of the day; and the many local businesses which generously donated raffle prizes. The Friends of Gledhow Valley Woods invite you to their 11th Annual Family FunDay! Meet birds of prey, rats, bees, frogs, rabbits and other wildlife guests. Live performers including Samba Tigers Band and a Magic Act. The Allerton Grange Fields are to become publicly accessible for community use following the completion of the construction of the new Allerton Grange School in the summer of 2010. The Friends of Allerton Grange (which is a voluntary association made up of local residents) is seeking to protect and enhance the fields for present and future generations to enjoy. The form can also be found on the Friends of Allerton Grange web site, together with more information about the group and its aims. The form should be completed and returned to the Friends of Allerton Grange by Friday 2nd July 2010. The bluebells are now out in full bloom in Gledhow Valley Woods. If you would like to see them don't wait too long - they're usually only at their best for a couple of weeks, depending on how kind the weather is. Residents who live near Gledhow lake are being asked to be on the look-out for a vandal who is deliberately letting the water out, and putting the wildlife there at risk. Gledhow Lake nestling in the woodland at the side of Gledhow Valley Road has been in existence for more than 150 years. It is home to many birds, including kingfishers, and other species, which are now under threat by someone sabotaging the lake's drainage mechanism. 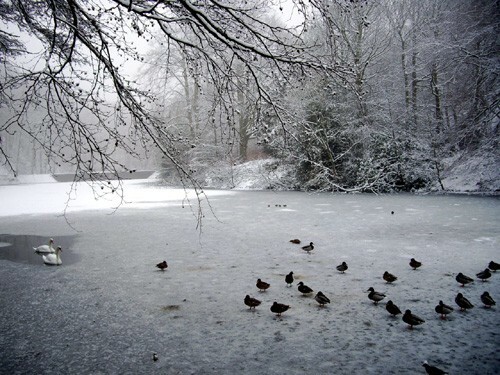 In the latest incident, which was discovered on Thursday 15 April 2010, local people were dismayed to see the lake almost empty, after it would seem someone had broken into a locked chamber and opened the draw-down valve. Over the course of the next few hours the lake's water drained away leaving aquatic species and nests stranded on mudbanks. Leeds City Council staff were alerted by complaints that flows in Gipton Beck downstream were unusually high. As well as damaging the local wildlife this irresponsible action is also costly to repair, with ultimately council tax payers footing the bill. This is the second incident in recent weeks which has put the wildlife at the lake at risk. Last month specialised man hole covers were taken. Both incidents have been reported to the police. Anyone with information is asked to contact The Roundhay, Alwoodley and Moortown Neighbourhood Policing Team via: 0845 60 60 606 or call Crimestoppers anonymously and in confidence on: 0800 555 111. The BBC website also has a short piece based on this issue. There will be an FGVW stall at the St Matthew's Easter Fair on Saturday 27th March 2010 (10.30am-12.30pm) promoting the group, selling FGVW merchandise (including coasters, place mats, greetings cards, postcards, framed pictures, badges & photos), and providing general information about Gledhow Valley Woods and the Group itself. 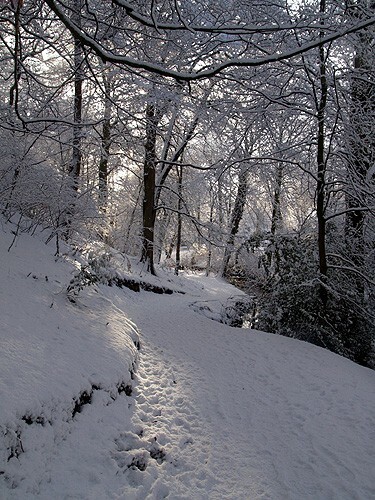 We need your help finding great winter photos of Gledhow Valley Woods for use on our next range of fund-raising Christmas cards. There will be prizes for the winning photos, including some fine quality organic wine (courtesy of Ecology Building Society) and some of the finished Christmas cards. The photographer will also be fully credited on the cards themselves. We hope to short-list the entries and then let the public vote on the winners at this year's FGVW Family FunDay (Saturday 19th June 2010). 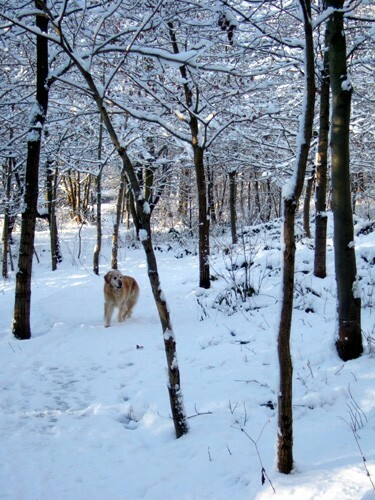 1) Photos must have been taken in Gladhow Valley Woods, although it does not matter how old they are. 2) Unfortunately we can only accept photos submitted in digital format e.g. photo files from a digital camera, or scanned photos (.JPG, .TIF, .BMP, .PCT). 3) Photos can be submitted by e-mail, or on CD-ROM, DVD, ZIP Disc, memory card (any kind), or USB memory stick. If requested, we will return your discs, cards or sticks as soon as we've copied the photos. 4) Photos should have a resolution of 2MP (2 megapixels) or more i.e. 1600x1200 pixels or more. 5) If scanning a printed photo, please scan at a resolution of 300dpi or more. If any of the above notes are confusing, or if you need any other information, please give Adam a call or drop him an e-mail. We need your help deciding what projects to undertake during this year's Action Mornings. If you have any ideas for work you think needs doing in Gledhow Valley Woods, please contact us and let us know. All ideas will be considered no matter how large or small they are! For more details of the project and photos and the awards ceremony, please see the Community & City Pride Awards Ceremony page. Photos of the actual project in progress can be found on the Rebuilding the Gledhow Lake Jetty page. On Friday 26th March 2010 (8.00pm) at the Three Hulats Pub, 13 Harrogate Road, we will be holding a small event to celebrate FGVW winning the Community & City Pride award and to thank our volunteers for all their hard work. All FGVW volunteers welcome. Food will be available as at the AGM.